Equimins Blooming Pet Cod Liver Oil is a pure and natural solution that will help promote good health, a shiny coat and bright eyes. Especially suitable for cats and dogs with a dull coat, Blooming Pet Cod Liver Oil is also rich in Vitamins A, D and E that will help revitalise their skin, whilst promoting a glossy and healthy coat. 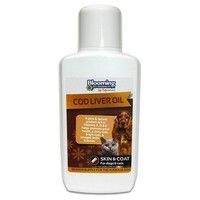 Regular use of the cod liver oil will also strengthen and support your pet’s teeth, bones and joints.